Recipient of more Patents and Awards than any other anti fatigue ergonomic mat. Could a simple floor mat receive US Patents for Safety and Ergonomics, while winning the Industrial Design Excellence Award? Barefoot did. But Barefoot is no simple mat. Barefoot ergonomic matting has achieved all of that, and much more. But Barefoot is no simple floor mat. It is the most achieved product in the industry. Proven in university testing, Barefoot ergo mats will easily compare itself against all of THE COMPETITION. Barefoot mat broke the rules by making very expensive tooling. But, in turn, you get a high-performance ergonomic mat that cost an extra $0.50 per unit. 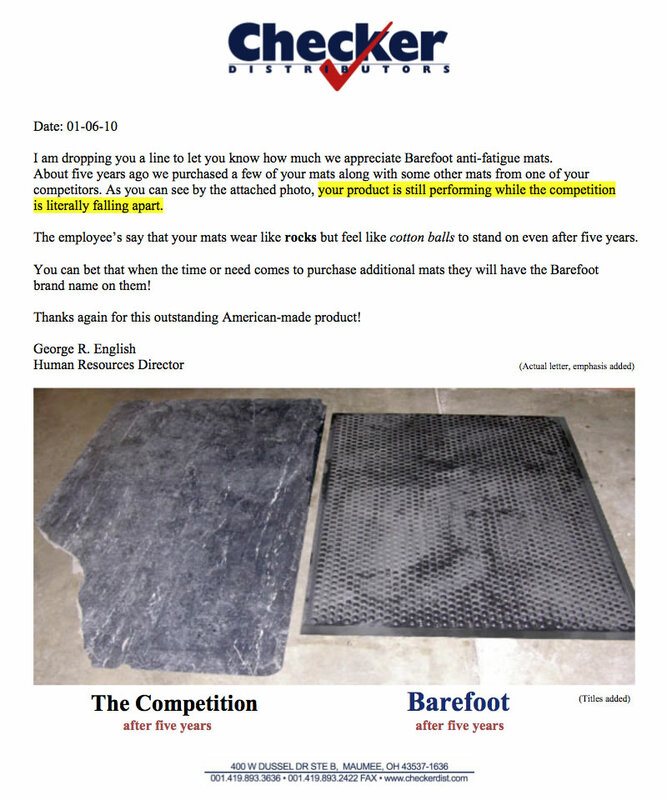 Barefoot ergonomic floor mats uses quality rubber found in athletic shoes. Our material is un-compromised, without cheap fillers that are found in almost every import. And Barefoot mats are made only in the USA, if that matters. If Value equals performance + durability / cost, then the most valued ergonomic anti-fatigue floor mat on earth has a name, Barefoot industrial ergonomic mat. Barefoot is not just an anti-fatigue mat, not just an ergonomic mat, or ergo mat, but a highly effective safety mat that provides exceptional comfort for people who stand. While most floor mats are made for sale, Barefoot anti fatigue mats are engineered for standing. Concrete might be more durable, but Barefoot has much better ergonomics, the kind of ergonomics that provide an effective measure of comfort for everyone who stands.